What an SUV is to cars, the Flex is to strollers. 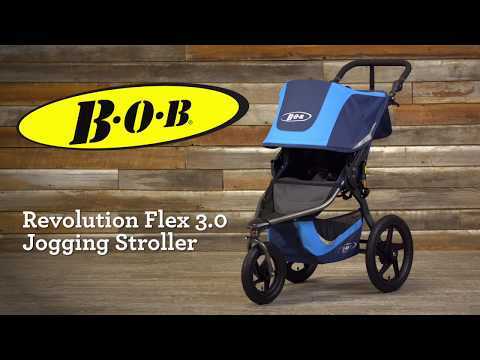 BOB’s super-popular Flex now has more storage, more seat padding and extra reflectivity. An adjustable suspension system and UPF50+ multi-position canopy ensure passenger comfort whatever the terrain and weather. For parents, the padded handle has 9 position options, and the big flip-flop-friendly parking brake is easy to apply. Folding the Flex is a simple 2-step process that you can do with one hand for smooth loading and unloading. 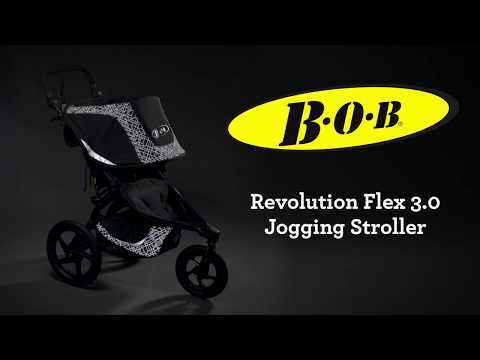 Front wheel swivels for maneuverability, and locks forward for stability when jogging or on tough terrain. Coil spring and elastomer core shock absorbers provide 7.5cm of wheel travel. 2-position shock-release knobs fine-tune the suspension for varying occupants and cargo. Padded seat reclines from vertical to 70° for comfort. UPF 50+ rated canopy adjusts through 5 positions and 125° for protection against the elements. Large viewing window with a magnetic cover lets you keep an eye on baby. Lunar black colourway has an all-over reflective print, so you can’t be missed on low-light outings. Low Boy Cargo Basket provides more undercarriage storage than ever before.